Beds where not good to sleep in but everything else was good.really good size of apartment and good size of pool for kids. 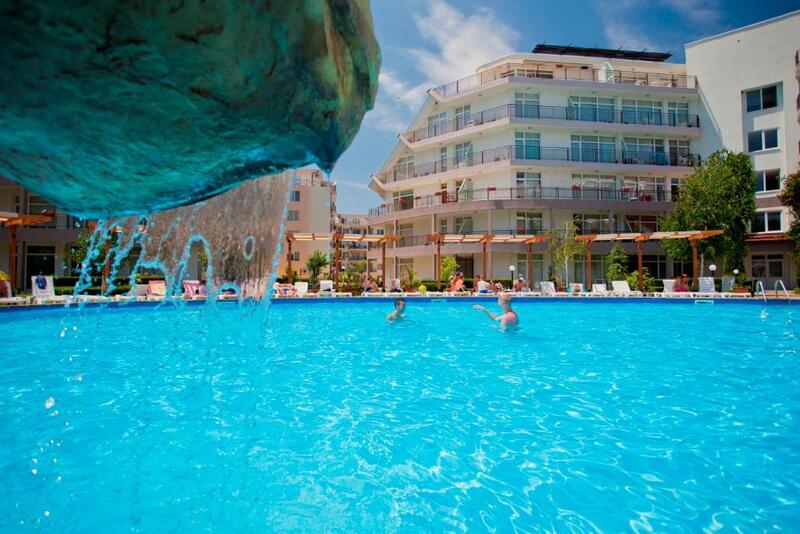 Nice pool, 2 big balconies in the apartment, all necessary appliances in the kitchen, clean and neat place. There’s a grocery just in front of the complex. Everything was clean and new. Loads of space in every room. Good balconies. Sun Village Apartcomplex This rating is a reflection of how the property compares to the industry standard when it comes to price, facilities and services available. It's based on a self-evaluation by the property. Use this rating to help choose your stay! 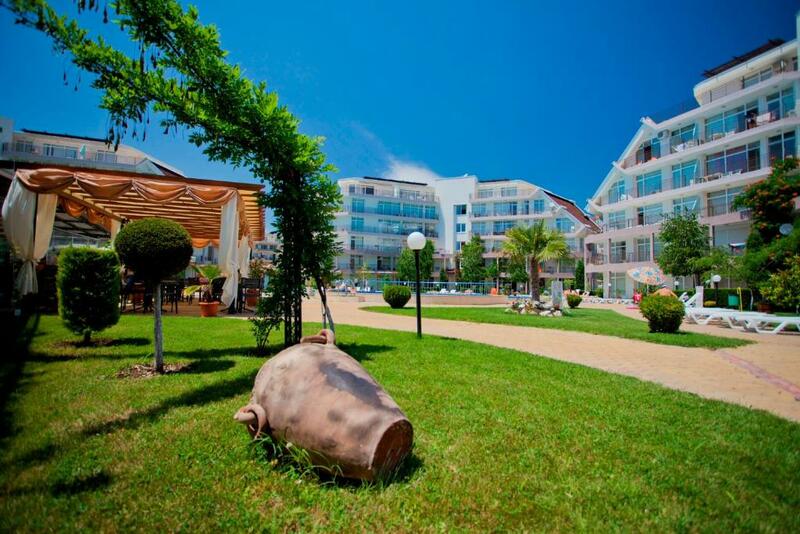 Sun Village is an apartment complex, located a 10-minute walk from the center of Sunny Beach and a 15-minute walk from the attractive sandy beach. A large pool, a restaurant and a bar area are on site. 24-hour security is offered. All apartments are fully furnished with kitchenette facilities, kitchenware and a coffee machine. A furnished balcony or terrace is also provided. Apartments are cleaned on a daily basis and linen is changed twice a week. 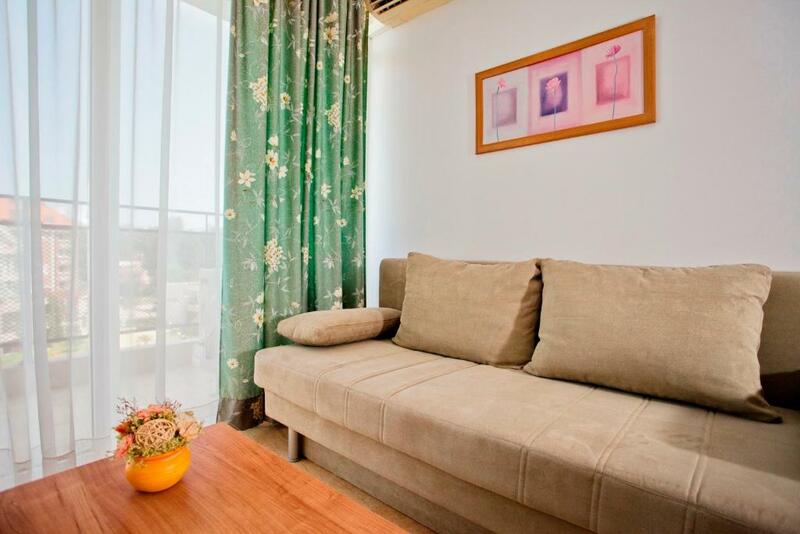 Sun Village is a 3-minute walk away from the well-known Palma market. Around the complex there are numerous supermarkets, dining facilities, fast food shops and restaurants. 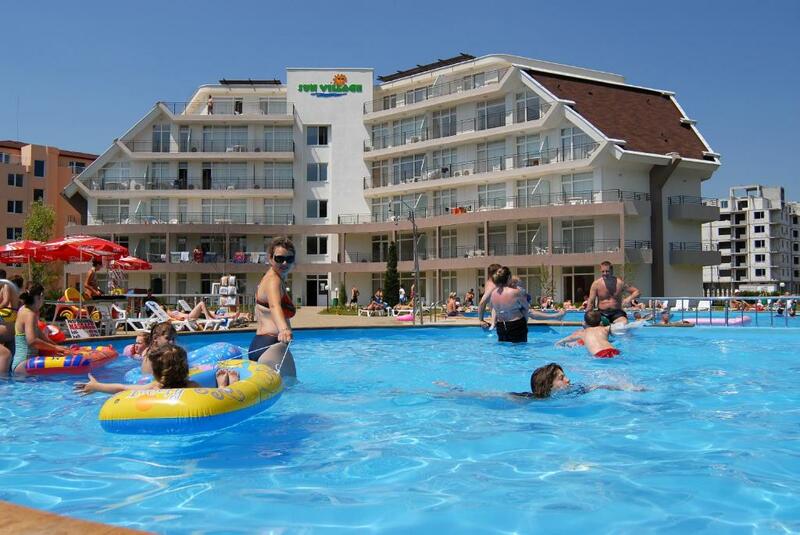 It is also located next to the Action Aqua Park in Sunny Beach. When would you like to stay at Sun Village Apartcomplex? One-bedroom apartments have a double or a twin bedroom and a double sofa bed in the living room. Maid service is daily and linen is changed twice a week. 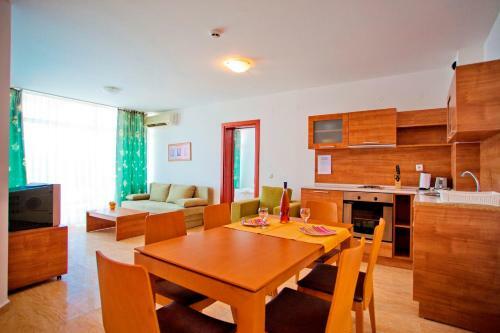 2-bedroom apartments have a double room, a twin room and a double sofa bed in the living room. There are 2 bathrooms and 2 toilets. SUN VILLAGE is a friendly and home-like place for a summer vacation. The spacios apartments are convenient for families and groups. 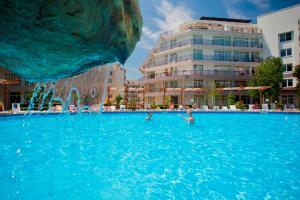 The beach, resort centre, aquapark and bars are within 10 min walk. You are welome to explore further. Sunny Beach can be noisy and busy during day and night. Sun Village's location is quiet and at the same time on the threshold of all the abundance the resort can offer. WiFi is available in the hotel rooms and costs BGN 5.87 per 24 hours. House Rules Sun Village Apartcomplex takes special requests – add in the next step! Sun Village Apartcomplex accepts these cards and reserves the right to temporarily hold an amount prior to arrival. Please note that breakfast and dinner are served individually per menu. Please inform Sun Village Apartcomplex of your expected arrival time in advance. You can use the Special Requests box when booking, or contact the property directly using the contact details in your confirmation. Cleaning extremely poor. Staff totally unhelpful. Pool never cleaned in time for it to open at 9am. Breakfast is not included, free wifi is not available and price for wifi is unreasonably high, charged per device. Staff were rude, towels or bedsheets not changed once whilst we were there. Shower freezing cold in the 5 rooms after the first night and three of the lads lost their mobile Phones. A couple of the phones were taken whilst on charge in the room and had little or none help from staff to find the phones. Oh also, fines are handed out like confetti for minor incidents. It looks cheap to stay but they take deposits and keep them as they want. Sunny beach itself was great and cheap for food, drinks and to go On excursions. Overall we have many negatives about the complex because with a bit more investment in apartments and design this place could be a promising place to stay. Also staff need to listen to customers and act on reasonable requests which they make. For example: towels placed on floor as stated in their information not changed, (they just folded sheets we had used the night before), so complaint about the towels, took around 4 hours to be rectified. New towels were dumped on table and old ones still left in bathroom It was a poorly operated complex, more expensive than another alternative hotels and in fact not worth the money which was paid. I should get a refund merely for staying there. Everything with money at this hotel even wi-fi, hated they wanted to charge for everything despite the fact that things were chipped like glasses in the rundown cupboards. You'd to pay to use the hair dryer!!!! Rooms were relatively dirty, glad we only stayed the four nights. Not convinced cleaning done every third day, we were there four! Furniture lacked comfort and appeared dated. No lamps Lack of clean bed sheets. Not enough clean towels. The room never appeared to be swept. Blinds falling to pieces One light in main lounge with 4 bulbs blown Shower damaged and water leaking Pipes behind a box in toilet kept opening - looked like a tunnel to somewhere! No instructions for the microwave or cooker Someone had to go upstairs to get the lift to go down because it stopped and would not close Sofa bed did not convert into proper sofa so people had to sit round dining table only No where to relax apart from on bed Instructed not to move furniture to our particular needs When keys being handed in (when we went out for the day) they always asked if we were checking out Did not like idea of passports being left unsecured in cubby holes in reception where anyone could take them if reception was unattended The list goes on, but these were the main issues for us as a family of 5. Maids didn't speak English and wouldn't give us extra towels for drying up and hand towel.